Dr. Daniel Nejat practices with the philosophy of a conservative, minimally invasive and gentle approach in treating his patients. He also believes in educating patients about their dental needs and good oral hygiene, as maintenance of their teeth and implants are vital for a successful long term periodontal and implant treatment. Dr. Nejat’s calm and smooth chair-side manner is known to relax his NYC dental implants patients and make them feel at ease when it is time to receive dental therapy. Dental implants replace missing teeth, and the design of a dental implant is based on the structure of a natural tooth. A natural tooth is one piece commonly described as having two main parts: One part is the crown that sits above the gums. The second part is a root that sits securely in your jawbone. A dental implant treatment may involved several pieces. However, it may also be described as having two main parts. One part is a restoration that is custom fabricated to match the shape of a natural tooth crown. 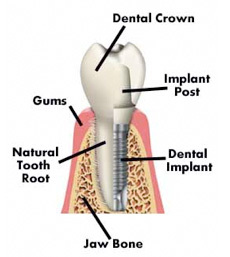 The second part is the implant that replaces the function of a natural tooth root. Implants are made of titanium or titanium alloy. Unlike most materials, our body normally accepts titanium without infection. The first phase of implant treatment involves creating an opening in the jawbone in preparation for the implant. The implant is placed under the skin and into the bone at the first surgical appointment. This surgical appointment is performed in the dental office under local anesthetics with or with out oral sedation. The implant is then placed, followed by a healing cover. Depending on the implant system, the gums may be sutured and a temporary denture placed. The site immediately begins to heal, a process known as oseo-integration takes place, where bone molecules begin to attach themselves to the titanium surrounding the implant. Then, the dental implants are allowed to heal. It usually takes between two to four months for the bone to securely bond to the entire implant surface. After this healing time the implants are exposed at a brief second surgical appointment prior to placing a post inside. The post becomes the extension to which a crown is attached. The total process tends to take a period of four to seven months. The final phase involves the custom restoration being fitted and securely placed.